When you are searching for the most trusted name in New Jersey full-service movers, look no further than the experts at Booth Movers! Whether you are planning a move across town or around the globe, our full-service moving company has the experience you need for a seamless relocation process. Since the 1940s, Booth Movers has employed the best New Jersey full-service movers in the industry. As proud members of the American Moving & Storage Association and the New Jersey Warehousemen & Movers Association, we are dedicated to being the premier choice for all of your moving and storage needs! A professional moving company should be capable of handling relocations of every size, and at Booth Movers we have the expertise to handle all of the logistics that come with a New Jersey full-service move. As a proud agent for Atlas Van Lines, our expert team of New Jersey full-service movers is connected to a global network of moving and storage professionals. From free in-home estimates to exceptional customer support, there is no better choice than Booth Movers for your full-service moving needs! Our commitment to quality service and customer care is what sets our Bergen County movers apart from industry competitors. Wherever life takes you, you can count on our full-service moving company to handle all the details of your relocation. Apartment Movers – Need help packing and moving your apartment? No problem! Just give our New Jersey full-service movers a call today! Senior Moving – When it comes to quality moving services founded on care and respect, there is no better choice than the professionals at Booth Movers. Household Moving – For homes big and small, our Bergen County movers have what it takes to help you have a moving experience that exceeds your expectations. 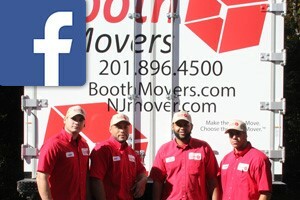 Booth Movers has led the industry as the most trusted name in New Jersey full-service moving companies since 1945. To find out how we can help you plan your next move, give us a call today! You can also fill out our online form to request your free, no-obligation moving estimate!